Transparency Market Research (TMR) has published a new report titled, “Bronchitis Treatment Market - Global Industry Analysis, Size, Share, Growth, Trends, and Forecast, 2018–2026”. According to the report, the global bronchitis treatment market was valued at US$ 3,432.62 Mn in 2017. It is projected to expand at a CAGR of 3.6% during the forecast period. The global bronchitis treatment market is anticipated to be driven by an increase in mortality and morbidity of bronchitis during the forecast period. The bronchitis treatment market in Asia Pacific is expected to expand at a high CAGR of 4.0%, due to the high prevalence of diseases, improvements in the health care sector, rise in awareness, and increase in focus on research and development. The global population is aging rapidly, especially in a few developed countries such as the U.S., most of Western Europe, and Japan. Developed economies witness a high rate of aging as compared to that in developing countries. This is attributed to improved health care infrastructure, favorable reimbursement policies, and advancements in health care facilities in these countries. Moreover, access to various diagnostic and treatment services has improved in recent years, especially in developed economies. This, in turn, has increased the life expectancy of the population. The geriatric population is more prone to develop respiratory conditions. Increase in number of geriatric people leads to high rate of ailments, which in turn is likely to propel the bronchitis treatment market. Cigarette smoking is a major cause for the development of chronic bronchitis. The number of smokers are increasing globally, and while the U.S. has witnessed a decline in the percentage of people smoking, there are still 40 million adults who smoke, and 20 million are likely to die prematurely, unless they quit. Furthermore, exposure to secondhand smoke raises complications for people suffering from bronchitis. Such alarming statistics indicate that the habit of smoking and increase in number of smokers are likely to propel the bronchitis treatment market. The global bronchitis treatment market has been segmented based on type, drug class, distribution channel, and region. Furthermore, in terms of type, the market has been divided into chronic bronchitis and acute bronchitis. The chronic bronchitis segment is likely to account for a leading share of the global market during the forecast period, owing to high morbidity and mortality rate. Based on drug class, the bronchitis treatment market has been classified into antibiotics, anti-inflammatory drugs, bronchodilators, and mucolytics. In terms of distribution channel, the market has been segregated into hospital pharmacies, retail pharmacies, and online pharmacies. The retail pharmacies segment held a significant share of the market in 2017, due to a rise in the sale of over-the-counter bronchitis therapeutics. 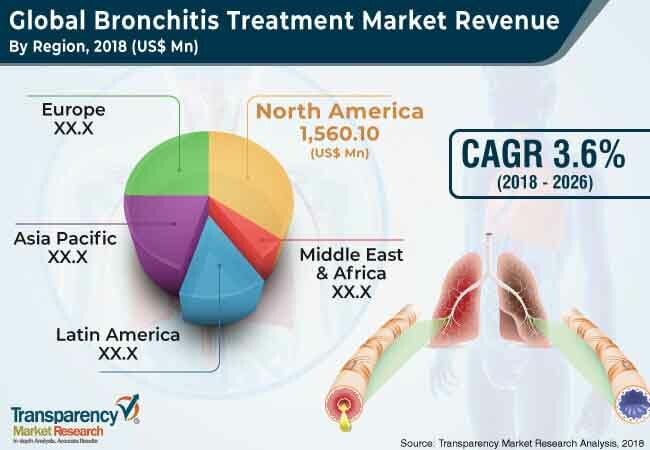 In terms of region, the global bronchitis treatment market has been segmented into five major regions: North America, Europe, Asia Pacific, Latin America, and Middle East & Africa. North America is projected to hold a leading share of the global market during the forecast period, owing to high awareness, increase research and development expenditure, and rise in geriatric population. Europe is anticipated to account for a significant share of the global market between 2018 and 2026. Increase in incidence of bronchitis is expected to fuel the market in the region during the forecast period. The market in Asia Pacific is likely to witness robust expansion during the forecast period, due to a surge in health care expenditure. Moreover, increasing focus of key players on expansion in Asia Pacific, large untapped population, and rising awareness about bronchitis promote the bronchitis treatment market in Asia Pacific. The bronchitis treatment market in Latin America is anticipated to expand at a steady pace from 2018 to 2026. Key players operating in the global bronchitis treatment market include AstraZeneca, Novartis AG, GlaxoSmithKline plc, Dr. Reddy's Laboratories Ltd., Melinta Therapeutics, Sanofi Aventis, and Boehringer Ingelheim International GmbH. Companies operating in the global bronchitis treatment market focus on strategic collaborations to leverage footprint in emerging markets such as Asia Pacific and Latin America.